The Unity Candle ceremony is the lighting of candles to symbolize the joining of two families or clans. 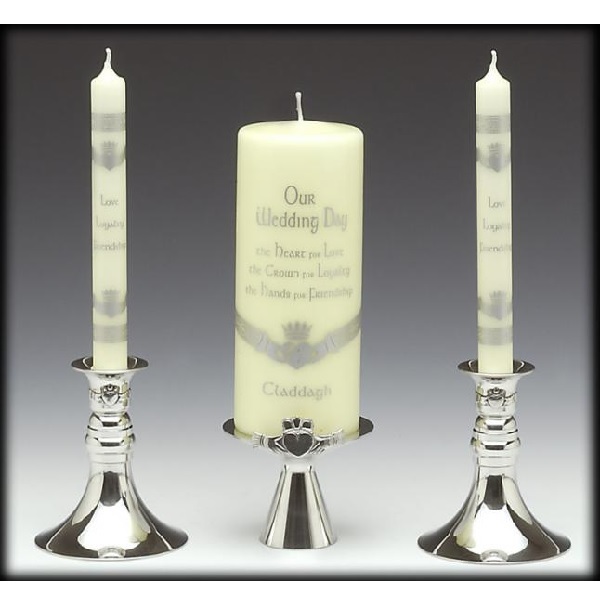 The outside taper candles represent the families of the bride and groom and the larger center pillar candle represents the new family formed by the marriage. Unity Candles may be adorned with ribbons, flowers and Celtic designs. Celtic designs such as the Claddagh, Celtic knots, shamrock, thistles or Luckenbooths are popular for Celtic weddings. Traditionally, a member of each family lights the outside candles before the ceremony. The light of the single center candle in unison by the bride and groom represents that they, as individuals, are joining as one. The extinguishing of the individual tapers symbolizes their intent to sublimate their individual needs to the greater good of their union. Those who wish to place a greater emphasis on their individuality may opt to have all three candles lit and in their holders as a celebration of the bride and groom as individuals and of their new union. Couples who are bringing children into the marriage may choose to have additional tapers representing the children, who can come forward and join in the lighting of the Unity Candle. Most couples keep their Unity Candle to light on special occasions, such as their wedding anniversary. Others may decide to use it more broadly as a part of special celebrations, incorporating it into an annual family celebration.